Tom Goodwin completed his major league career with the Chicago Cubs. Former major league outfielder Tom Goodwin has been hired as first base coach for the Mets. Goodwin, 43, most recently has served for the past three sesaons as minor league outfield and baserunning coordinator for the Boston Red Sox -- the areas the first base coach with the Mets would be responsible for overseeing. “He is outstanding,” a major league official said. The Mets interviewed internal candidates Kevin Morgan and Jack Voigt, and also were believed to have been interested in former major league outfielder Doug Dascenzo, who has just been hired to oversee those areas for the Atlanta Braves minor league system. 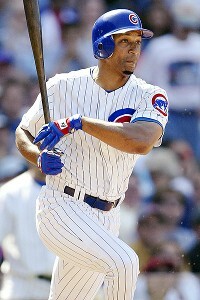 Goodwin completed his major league career, which spanned parts of 14 seasons, in 2004 with the Chicago Cubs. He primarily played center field. The Mets already have announced the remainder of Terry Collins’ 2012 staff. In addition to returnees Dan Warthen as pitching coach and Dave Hudgens as hitting coach, former Oakland Athletics manager Bob Geren arrives as bench coach. Tim Teufel and Ricky Bones have been promoted from Triple-A Buffalo to fill the third base and bullpen coaching vacancies. Former third base coach Chip Hale departed to serve as Bob Melvin’s bench coach with Oakland on a two-year deal. Mookie Wilson and Jon Debus were invited to stay with the organization in other roles. Ken Oberkfell was not retained.